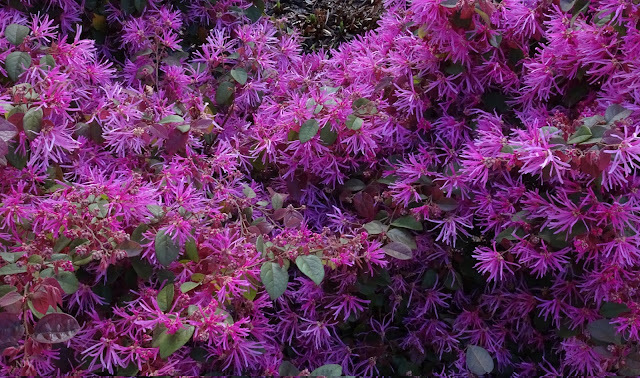 Loropetalum is a genus of three species of shrubs or small trees in the witch-hazel family, Hamamelidaceae, native to China, Japan, and south-eastern Asia. The name Loropetalum refers to the shape of the flowers and comes from the Greek loron meaning strap and petalon meaning petal. Flowers are produced in clusters during spring and are similar to those of the closely related witch-hazel. Each flower consists of four to six (depending on species) slender strap shaped petals 1-2 cm long. Illustrated here is Loropetalum chinense var. rubrum.